Real time cloud based inventory management with mobile inventory processing. Barcode scanning using smartphones. Online accounting solution for small businesses. Link inventory and financial transactions, automate business process. QR Inventory - QuickBooks Online integration links comprehensive inventory control and cloud accounting. 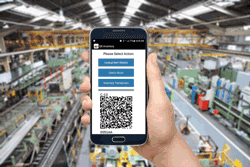 Use QR Inventory to track inventory efficiently using barcode scanning and mobile devices for data entry and look up. Use inventory transactions recorded in QR Inventory to create financial transactions in QuickBooks Online with several clicks. QR Inventory is a cloud based inventory and asset tracking software with supplementary mobile application for android and iOS. Your employees can use their own mobile devices (smartphones or tablets) with QR Inventory mobile application installed to track assets and inventory in real time as inventory transactions happen. In addition to tracking inventory, then can look up stock and location, access item specifications, fill out mobile forms, record assets maintenance and review past assets services, collect electronic signatures, create and e-mail pdf documents, and more. Data collected and recorded using mobile application are sent to a secure cloud and are available to all authorized users in real time. Your QuickBooks inventory is always synchronized with QR Inventory. Use QuickBooks to maintain inventory items, and QR Inventory for advanced, multi location inventory control, barcode scanning inventory tracking using smartphones, and comprehensive inventory reports. Import or update inventory items from QuickBooks to QR Inventory with one click. If you do not have inventory entered into QuickBooks Online, and prefer to use QR Inventory capabilities for initial inventory entry and count on site using barcode scanning, you can enter inventory in QR Inventory first, then export it to QuickBooks Online. Use inventory transactions recorded in QR Inventory to create financial transactions, such as invoices, bills and purchases, directly in the QuickBooks. Select which QR Inventory transaction types correspond to financial transactions in QuickBooks. For example, link Sales transaction to QuickBooks invoices, and Restocking transaction to bills or purchases. 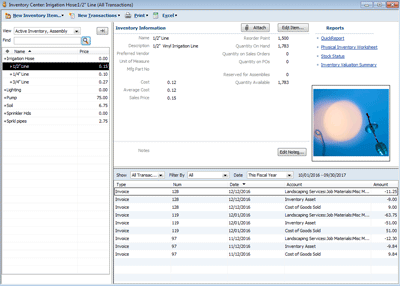 Use customizable QR Inventory reports to find transactions that were not yet transferred to invoice or bill. Filter transactions by dates, project, client, etc. to quickly find what you need. Select which transactions you want to include in the QuickBooks invoice or bill. Inventory items, quantities and prices are already pre-filled for you, but you can do manual corrections if needed. Submit invoice or bill to QuickBooks Online. Submitted transactions are removed from the list to eliminate duplicates. Repeat until all invoices / bills are created. If you are using a desktop QuickBooks product, such as QuickBooks Pro, QuickBooks Premier or QuickBooks Enterprise, we can also integrate it with QR Inventory using a Web Connector or manual data exchange. Please, contact us for details if you are interested.